HUAWEI Mate 20. HUAWEI Mate 20 Pro. HUAWEI Mate 20 X. 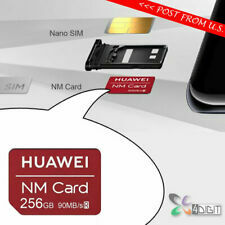 - NM Cards occupy the 2nd Nano-Sim slot, so can use 2 SIM & 1 NM. - Reading Speed at 90MB/s, Writing Speed at 70MB/s. 256GB Capacity. UHS-I Speed Grade 3 (U3) & Class 10. Record and play 4K UHD video. With ultra-fast read & write speeds up to 100MB/s & 90MB/s respectively, the Samsung 256GB EVO Select lets you transfer a 3GB video to your notebook in just 38 seconds. Trending at $58.26eBay determines this price through a machine learned model of the product's sale prices within the last 90 days. $Product Details: ---256GB of external memory ---Plug & Play ---Optimal speed and performance for SDXC compatible devices ---Class 10 speed (based on SD 2.00 specification) ---Holds countless amounts of data, music, video, images etc. ---FREE SD Adapter is included Compatibility: ---Mac OS ---Windows ---Android ---Symbian ---Linux Shipping: ---USPS Package contents: ---1 256GB microSDXC card with SD Adapter. $Product details: ---256GB of external memory ---Plug & Play ---Optimal speed and performance for microSDXC compatible devices ---Class 10 speed (based on SD 2.00 specification) ---Holds countless amounts of data, music, video, images etc. Package includes: --- 1 X 256GB microSD Card & Free Adapter Shipping: ---USPS (3-9 Business Days) Returns: ---30 Days Questions: ---We are here for you 24/7 and all your questions will be answered within 24 hours. Optimal speed and performance for micro SDHC compatible devices. 256 GB STORAGE DEVICE. Class 10 speed (based on SD 2.00 specification). Holds an enormous amount of data, music, video, images etc. 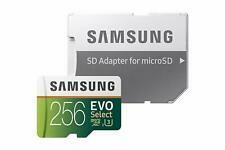 4 out of 5 stars - 256 GB micro SDHC Flash TF Memory Card Class 10 Micro SD Free SD Adapter. 34 product ratings34 product ratings - 256 GB micro SDHC Flash TF Memory Card Class 10 Micro SD Free SD Adapter. Size:256 GB | Style:Card and Adapter Only. Item Weight 0.32 ounces. Other Technical Details. Product information. Huge 256GB Capacity. - High Speed (Speed Class 10), UHS-I. 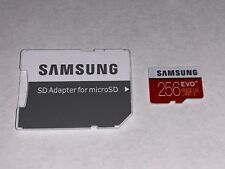 New 256GB micro SD memory card with adapter and USB reader. Note that USB reader may be different color than in picture.